The last time Gilmore Girls was on the air, Barack Obama had just announced his run for president and hope was the only thing on our minds. Hope for a better future, change, and a world that could take care of us when the show ended. Fast-forward to the train-wreck/horrible Twilight Zone episode that is 2016, and the world is much, much different. 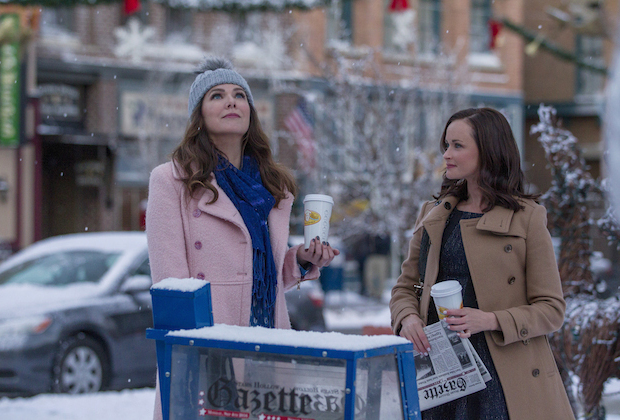 But, there's one thing that came when we needed it most, the Gilmore Girls revival. Now, I've only seen the first episode, Winter, but all I needed was five minutes to jump back into the warm and cuddly world that is the Gilmore Girls. It felt like home and it's just what I needed. Each episode is an hour and a half, which almost makes up for the fact that we only get four episodes, almost. You can get away with not binge-watching this because there's so much to love in one episode. Although, I'm already itching to get home and start the next episode. There's just so much nostalgia that comes along with the revival that it almost makes you forget the terrible year we're having. That's always been the beauty of Gilmore Girls; it can transport you into a world of enchantment with making it seem like some fantasy show. It's not Harry Potter, Once Upon a Time, Narnia, or anything of the genre, it's a simple show that's subtly magical. Just as Lorelai (jokingly) describes in this episode, the entire town was actually constructed in a giant snow globe, and she couldn't be more right. Filled with the fast-talking mother and daughter duo's wit and puns, the show takes us right back to the Stars Hollow we know and love, and all the characters that make this show so special. The running jokes are just as good - Luke gives all his customers a fake Wi-Fi password, Rory has a boyfriend that nobody can remember exists, and everyone is upset that Lane's husband Zack got a promotion at his job. The guest stars are great too and we were rewarded with even more evidence for the (totally plausible) fan theory that Twin Peaks and Gilmore Girls exist in the same universe when Ray Wise shows up on screen in the first episode. Even without all the guest stars, fast jokes, and Taylor's new town mission, the show still gives us what's it's best at, family drama. I'm not going to spoil anything (more than I already have) but the revival still managed to bring a tear to my eye with it's familiar, honest way of dealing with issues that have plagued all our lives at one point or another. At its core, Gilmore Girls is real, dramatic, and filled with overwhelming love and heartbreak. You'll definitely enjoy the Gilmore Girls revival. You'll laugh and cry and still wish that you could one day think of jokes on the spot the way Lorelai does. It'll be the escape you need. There's no mention of politics, poverty, discrimination, guns, war, or any of the darkness that has consumed us this year. Plus, there's only one mention of the Kardashians (so far) and it's perfectly okay because Lauren Graham delivers the joke in her special Lauren Graham way that makes everything okay. I need the Gilmore Girls revival. You need the Gilmore Girls. America needs the Gilmore Girls revival. The only thing missing is that beautiful theme song we all know and love, but maybe the Palladinos didn't want to overload us with so much nostalgia. The Gilmore Girls revival is just as cozy and warm as its always been, and couldn't come at a better time. Happy Binging!